There is no better time to do crafts with the kids then in Autumn. All you have to do is take the kids outside and collect brilliant red and orange leaves that have fallen from the sugar maples trees to use in crafts. 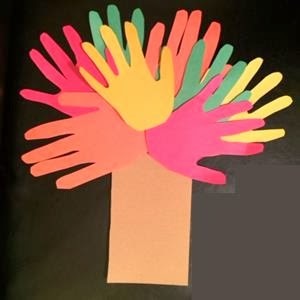 If you live in an area in which the leaves don’t change colors and fall to the ground, you can still do some Autumn leaf crafts by tracing hands onto colorful construction paper to represent leaves. Here is how to do one of the easiest craft projects you can do with kids and you will always love the results. 1. Simply trace the kids’ hands onto different colored construction paper and cut out the hand shapes. 2. Cut out a brown rectangle to be the trunk of your tree. 3. Have the kids paste the hands to the top of the brown trunk to represent Autumn leaves. Project and photo by Stephanie Felzenberg. I’m not sure when I first learned how to do this project but I’ve been doing it for over 10-years with the kids in my care.